In the world of German brewing, Kräusen refers to the intense proliferation of bubbles and foam formed during fermentation of a young or "green" beer. And Aufkräusen (literally to kräusen it up), refers to a historic brewing technique in which some green beer is added to a fully-matured lager. 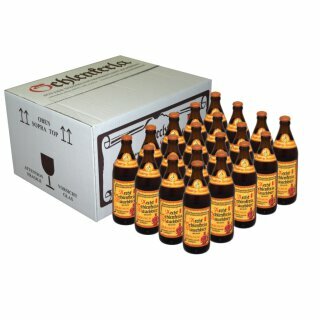 This is a very old and very typically German tradition, and today even English-speaking brewers refer to this technique as krausening. Krausening brings the vibrant freshness of young beer to the more refined, austere flavors of a fully-matured lager. Aecht Schlenkerla Kräusen starts out as normal Helles Schlenkerla Lager and matures for months in the old rock cellars underneath the brewery. Just before filling it is blended using the before mentioned "Kräusen" technique with classic Märzen Rauchbier. The result is an unfiltered, bottom fermented and amber color Märzen Lager hybrid with a vibrant and slightly smoky flavor.